The closet doors in my house are the bane of my existence. They are frightfully heavy track door models that refuse to stay on their tracks, get stuck, and make us all pull our hair out in frustration. These doors have been the source of much salty language overheard in our house, I assure you. Honestly, is closet door technology really so difficult? The doors in my daughter’s room were probably the worst. I don’t think she could even get into her closet for about 2 years, they were so badly stuck. In desperation, I had my husband take the darn things off for once and for all, and promised her I would replace them with some lovely vintage hankie curtains like the ones I always drool over on Pinterest. It took rather a long time to get enough handkerchiefs to cover the thing, but I persevered. Much more difficult was finding the time to get the curtain actually sewn up – sadly, the days when I would sew for hours upon end, everyday and into the night have disappeared into the ether. My daughter, who is ten and just starting to show the first signs of pre-teen snark, started to make little comments about the curtain, such as asking innocently whether it would be done before or after she leaves for college. Luckily for her, I woke up the other day with a distinct itch to do something crafty, and decided it was now or never: this curtain was getting done come hell or high water. Or kitties, as it turned out. My two fur babies were delighted with me for carefully laying out rows of vintage hankies for them to scamper about and wrestle upon. Ahhhh….so soft! I think I shall take a nap here. My littlest kitty, the 3-month old Nuka, thinks that everything in the entire world must be attacked and conquered; in particular, long, flowy bits of delicate vintage hankies which clearly pose a threat to the health and well being of kittenkind. Despite the over-enthusiastic attentions of my feline residents, I did manage to get the hankies stitched together. Of the roughly 40-50 sewing machines I own, I chose my trusty 1951 Singer 15 for the job. Totally reliable, easy to thread and wind the bobbin, produces a nice stitch, and is a pleasure to listen to as she sews up a storm. Isn’t she lovely? I paid $20 for her at an auction. And yes, that is a centennial badge you see on her! I really didn’t have any sort of a plan for this, just some rough idea of how big it should be. I just kept sewing hankies together until I had the dimensions I needed, which is why it looks a little wonky. If I took the time to plan it out properly, I can guarantee you I would never have finished it. Who has the time for carefully planned sewing projects? All stitched up, I then needed to decide whether or not to line it, and if so, with what: an old sheet, fabric, a vintage tablecloth? While I pondered, I pressed it, which sounds like a simple task, except that Nuka (aka: Chompy) thought that the dangling iron cord was an especially large mouse tail that needed to be attacked with much vigor. Scared she was going to bite through the cord and electrocute herself, I had to take many breaks to banish her from the room. Isn’t she cute? I just love her blue and cream coloring. Plus, of my 4 sergers, she’s the easiest to thread. Making this a truly quick and dirty project, I just folded down the top about 3 inches, stitched a line down it to create a casing, and threw it up on a tension rod. And there we have it! Two years of collecting the 80+ hankies involved, plus about two days of sewing, and my daughter finally has something to cover up her closet. She is thrilled, and I no longer feel like a bad mother for putting this off for so long! It goes nicely with her vintage fan collection, don’t you think? Lately, I have been quite busy going through my vast inventory of vintage treasure to find items to stock for Valentine’s Day (romantics, take note! It’s coming up quickly!). Heart shaped items, bright red fashion pieces, romantic sheet music, even an antique book of Tennyson’s poetry are all available in the Valentine’s Day section of Upswing Vintage. And of course there are the cards. I have quite a few in my store, the oldest of which date to the 1930s. I also recently acquired a huge amount of cards – valentines and otherwise – from the estate of a woman who apparently worked for the Gump’s card department back in the 1980s. I have vast amounts of very high end greeting cards like this that were sold at this legendary San Francisco department store 30 years ago, all in unused, mint condition. Perhaps my favorite thing I’ve listed so far is this book of 1950s push-out Valentines for children. There is not one inch of this item that is not adorable. From the little girl with the flocked dress on the cover (who is actually a push out valentine herself), to the cut and fold envelopes decorated with red and blue heart stick figures, to the tiny “kissing stamps” – it is enough to make you swoon with the cuteness of it all. While I am quite proud of the Valentine’s Day cards offered in my shop, I must admit I am not listing all that I have in my possession. I adore vintage greeting cards of all kinds, but these little tokens of love are a particular favorite. I must admit, I tend to hoard them for myself when I find them, but I thought I’d share some of my favorites with you here. Above are some of the first vintage Valentine’s Day cards I acquired. These are all from different decades, with the most recent being from the 1940s or so. And the oldest? That one up at the top looking all Victorian – because it is. This purple flowery heart Valentine is from none other than Raphael Tuck and Sons, the company which featured prominently in my last blog post. This gorgeous die cut valentine dates to the 1870s-1880s – isn’t it exquisite? The one next to it actually stands up, a style that was very popular from about 1895 to 1915. Many months ago, I came across three large scrapbooks from the late 1960s and early 1970s, all completely filled with greeting cards. The woman who made these scrapbooks lovingly pasted every card she received from her husband, her parents, her children and her friends in these books. I have spent hours pouring over them, reading the birthday wishes from friends, the Get Well sentiments after she had surgery, and the vast numbers of Christmas cards she received. But my favorite are the ones she gave to her husband, and those he gave to her. This couple gave each other cards for every single occasion: birthday, anniversaries, and Valentine’s Day of course, but also Easter and New Year’s Day. I am quite certain I have never given my husband a card for Easter, let alone New Year’s. Here are some of the Valentine’s Day cards they gave to each other. This couple, particularly “the hubby” as he signed himself, tended to favor the humorous cards. She was a bit more lovey dovey. Together, I’m sure they were perfectly balanced! Finally, we come to a love affair that really touched me. The man who gave his beloved these cards clearly adored her. The cards came to me along with numerous other documents from their life, giving me a tiny glimpse into their world. But the cards! They span three decades of their life together, from the early 1950s to the mid 1970s. Each one has a succinct, but very heartfelt note from him. The fact that she kept them with all her important papers gives me hope that she cherished him just as much. Is it voyeuristic to look into the lives of couples from long ago through the valentines they gave? Perhaps. But I prefer to think that I am preserving a bit of the love they shared. As they say, true love never dies. As a child, my nose was often found buried in a book. Painfully quiet and shy, I found it easier to engage with the characters in my stories rather than the real life world around me; thus, a lifelong love affair with books began. Me on my 4th birthday in 1975. I look pretty happy with my presents, don’t I? Fueling this passion was my mother, who would read to me when I was little, calling upon all of her dramatic powers to make the stories come to life. Her face would morph into the various expressions displayed by the characters on the page; her voice would be powerful, energetic, or ridiculous as appropriate. But my favorite part would be when she read something funny; she would fall right out of character and become mom again, and just laugh and laugh and laugh. I still love listening to my mother read stories, to my own children these days – it brings me right back to those times when we would cuddle on the couch and get lost in stories together. With this as a background, you can probably see why I am helpless when it comes to vintage children’s books. I see one and I just go weak in the knees with nostalgia. Serious book collectors often don’t like inscriptions as they prefer their acquisitions to be pristine, but that’s the first thing I look for in a clearly beloved children’s book. It’s hard to see but someone, probably mother, wrote the date 1911 next to the inscription by Aunt Alice. The inscription is what gives me a direct link to the long ago hands that touched this book. I like to think about little Jerome opening his Christmas present and finding the gorgeously illustrated “Dolly at the Seaside ABC” inside, a gift from his favorite Aunt Alice. Perhaps Jerome and his mother would laugh at the line, “I is for Ink which trickles and runs upon the floor / Naughty little kittie upset it with her paw” as they thought about their own mischievous kitten. And we can go even further with our imaginings. Perhaps Aunt Alice chose this book because she was enamored with the Victorian postcards of Raphael Tuck and Sons, the Dolly book’s publisher. She probably had no idea that those postcards, and in fact anything produced by Raphael Tuck and Sons, would become hugely collectible 100 years later. On the night of December 20th, 1940 the unthinkable happened: London was ferociously bombed by the Nazis and many buildings, including Raphael House, were utterly destroyed. Imagine it: 74 years of the company’s records and 40,000 original illustrations and photographs by some of the best artists of the day were gone in an instant. It turns the stomach, does it not? The company did survive this tragedy, although it combined forces with two other firms in 1959 under a new name. It is with all these things in mind that I find myself incredibly fortunate to be able to present to you not only “Dolly at the Seaside,” but also Father Tuck’s Noah’s Ark at Upswing Vintage. Beyond the stories and the beautiful illustrations, it is easy to be captivated by the history of the firm that published them. Perhaps your own wee readers would be just as delighted with the pictures as little Jerome undoubtedly was, that Christmas Day back in 1911. For further reading about Raphael Tuck and Sons, please see the Wikipedia entry on the company. To view an absolutely incredible collection of postcards and books published by the company, I encourage you to visit the marvelous TuckDB site. 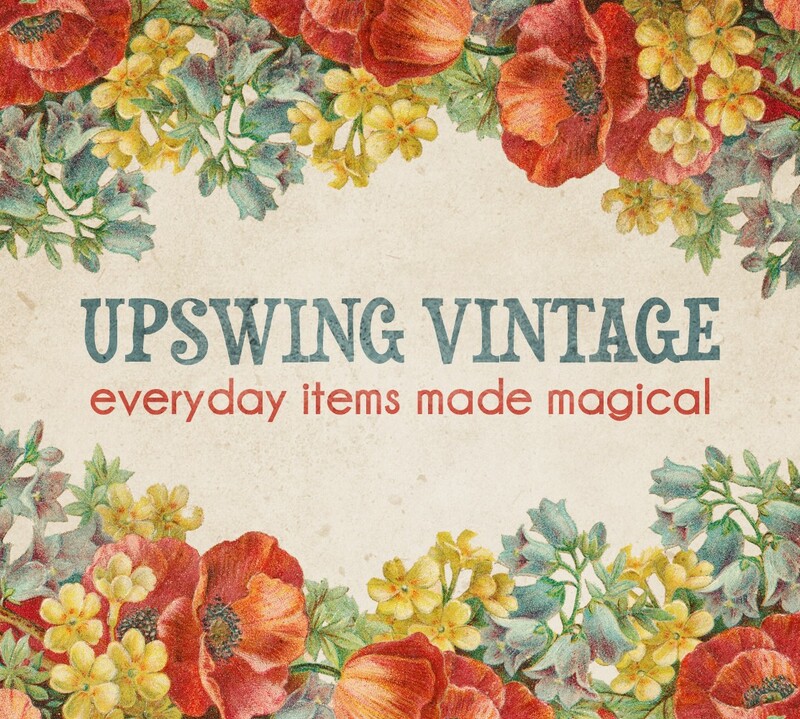 Upswing Vintage is now almost a year old. I had thought this blog would be as well, but here I am writing my first post. Ah well. I’ve spent the past ten months madly zooming about California on the hunt for vintage treasure of all sorts; there has not been time for blog writing. But then something happened yesterday that I took as a sign that my blog needed to finally find its way into the world. I was creating a listing for a 100 year old book I have called “A Message to Garcia.” I did an awful lot of research into this little book – really more of a pamphlet, including reading the thing cover to cover. I found the backstory of the book utterly fascinating, and spent an inordinate amount of time trying to figure out what would prompt the author, a Mr. Elbert Hubbard (b. 1856) to create such a hysterical rant about the laziness of American workers. Having come up with some interesting nuggets, I started to summarize it all into a listing, so that the customer would understand what made this work so important. Unfortunately, I had to leave the house before I finished the listing as my two sweet kitties needed a trip to the vet. When I returned, my computer had frozen, necessitating a restart. My work was lost. (You can not save draft listings on Etsy until all the little boxes are filled out….which I hadn’t done, sadly). After pouting about this mishap for awhile, I realized that perhaps the listing description was not exactly the best forum in which to present my findings. Customers tend not to read long-winded descriptions of an item, do they? But a blog – I can drone on about a subject as much as I like! So, here I am, having received a swift kick in the rear to get this thing going. I’ll be posting every few weeks or so, with interesting research I’ve dug up about my vintage finds, lots of pictures and maybe even a video or two of my vintage treasures in action.